National Service, Britain's name for conscription, existed between 1945 and 1963. In that time, two and a half million men were required to serve for two years with the armed forces. For some, it was a miserable penance. For the majority, it was just something that had to be done but for a lucky few, of whom the author was one, it was a time of travel and adventure. Following a six-year medical degree, with a further year of houseman posts, he chose to serve his conscription in the Royal Navy. However, the Navy required only a small number of doctors and selection was by interview in London. Being young, single and tired of the stultifying life of a student, the author opted for a posting in small ships abroad and was delighted to be accepted. The result was a mixture of travel and excitement with cheerful and lively companions in far-flung places including Borneo, Japan, Korea and Hong Kong. As the time for his National Service drew nearer he was unsure of which of the many paths within medicine he was to take. As will be seen, the forthcoming months were to be useful in reaching a decision. This exuberant story is recounted from notes and letters and commences with the author's time at the Edinburgh Royal Infirmary. 'Put him up in modified Russell Traction,' said the senior surgical registrar, 'and I will pin him in the morning.' Modified Russell Traction? My fellow house surgeon and I had no idea what he meant... Thus began a medical adventure. 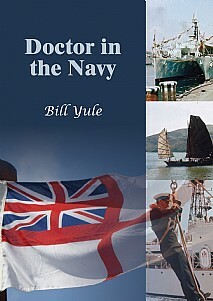 This true and enjoyable story will be of especial appeal to anyone who has served in the Royal Navy, all maritime enthusiasts and armchair sailors. This very different era of medical practice will both amuse and entertain current practitioners and anyone looking for a good read.